Tech Services has worked diligently to resolve the reported bed bug issue at station 2. There was evidence of bugs in one of the recliners and it was immediately discarded. We had Mr. Bug Killer spray and bug bomb the station. Additionally, Tracy put out bug traps just in case there was any remaining bugs mobile in the station. The traps have been empty and since the treatment we have rechecked the couch. Although we have not found any more bugs, we are going to play it safe and replace the couch with three recliners. The couch will be cleaned and stored (if any bugs are in the couch, storing it will kill them off). Identifying bed bugs is easy if you know what to look for. They can be easily seen and adult bugs are about the size of an apple seed. The bugs tend to concentrate and hide in crevices or seams of furniture. Though they are mobile, these bugs move slow and cannot fly or jump. If you see them wondering around it’s probably because they are searching for a new hiding spot or avoiding chemically treated areas. Infestations are common in sleeping areas and we normally encounter them when picking patients up from poorly sanitized hotels or homes. Going forward we need your help to ensure we don’t reintroduce bed bugs to the station. Anytime you are in a location where bed bugs are suspected, please double check your clothing and shoes before leaving the scene. Partner up if needed to check each other’s pants legs, shoes, gear bags and equipment. The few extra minutes you spend ensuring you’re not transporting bugs will save us $$ in the long run. The key to treatment is heat! So if you do find bugs on you, change your clothes in a safe location and dry them on high heat. 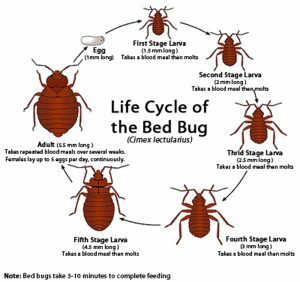 There are many articles and instructions on line for identifying and for treating bed bugs. Additionally, you can kill these buggers with Alpet D2 or Cidex spray, by mopping the floors with Pine-sol or Bleach water solution, or by spraying them with the specific bed bug spray we are purchasing for each station. Don’t forget to treat the seats in the truck or anywhere you suspect they could live and thrive!